DETROIT - They are delicate and pretty. So pretty, in fact, that a lot of people buy icicle lights to hang at Christmastime. However, you really don't want to see the real thing hanging from your gutters because, eventually, roof damage and water in your home can result. We usually start seeing icicles form all around town after we get a lot of snow and temperatures are below freezing. What happens is that heat seeping from your home into your attic warms the roof, and snow in contact with the roof starts melting. That snowmelt drips into the gutter, and then freezes into ice in the below-freezing air temperatures now that it's off the warmer roof. Over time, that ice builds up (it's then called an ice dam), and water starts dripping over the edge and freezing, forming icicles. 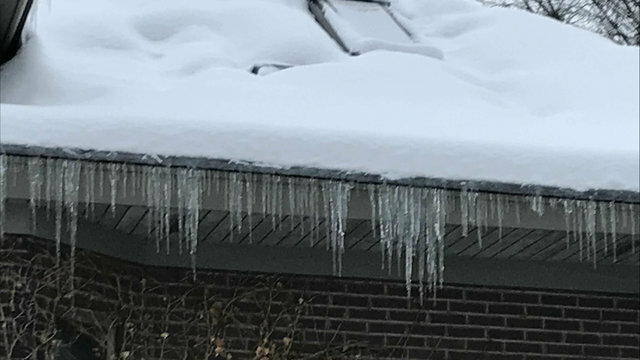 However, what you aren't seeing is ice also building up from the gutter back onto your roof, which can damage the roof and, especially after temperatures warm, that melting snow then starts dripping into your house. Over time, the drywall on your ceiling gets wet and, in some cases, can actually cave in. More often, though, it just gets very wet, which can lead to mold issues, and you don't want to deal with mold. Ever. However, there's a good news end to this story: Damage from ice dams can be prevented, and the way to do it is simple. All you have to do is make sure that your attic is cooler so the snow on the roof doesn't melt. How do you do that? By increasing the insulation in your attic, and improving air circulation in and out of the attic by improving your soffit vents (those little vents up there around the roof, usually on the eaves). 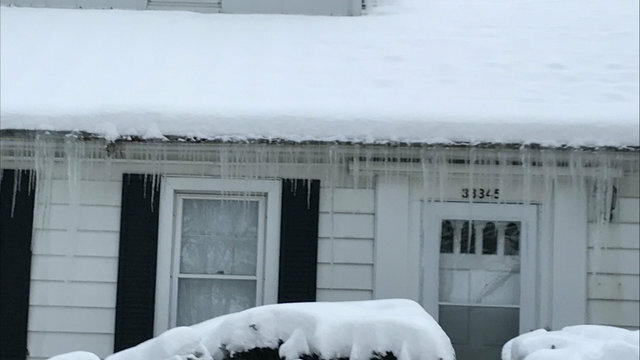 When I moved into my house 25 years ago, I noticed that I was getting ice dams in my gutters. I already had reasonable ventilation in my attic, so this clearly was an insulation problem. I don't remember exactly when, but at some point I went to the Home Depot around the corner and bought rolls of R-25 insulation and rented a truck from them to bring it all home, and then went up into my two attics and rolled them out. Keep in mind that if you do this yourself, you need to be careful with covering certain types of recessed lighting -- you'll want to ask about this, or hire a professional to do it for you. I rarely ever see an icicle anymore around my house, so that's one thing I don't have to worry about anymore. Yes, icicles are pretty, but let's just keep it to the pretty ones you hang at Christmas!